Chandler Engineering offers several pressurized curing chambers that are specifically designed to cure standard two-inch cement cube samples for compressive strength testing in accordance with API and ISO standards for oilfield cements. The curing chambers cover a wide range of operational temperatures and pressures to simulate a wide variety of downhole conditions during the curing process. Selection of the best instrument for your application is based on the number of cubes needed for testing, the size and features of each curing chambers. Each of the curing chambers has been designed for safe operation and have pressure relief and over-temperature protection. 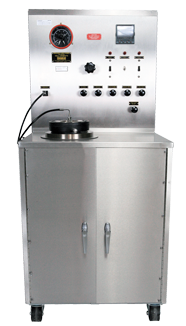 The curing chambers are an important part of any oilfield cement laboratory and are part of a complete line of cement testing instruments offered by Chandler Engineering. The Chandler Engineering Model 4207D Compressive Strength Tester is also an essential instrument used in conjunction with determining the compressive strength of the cube after curing in the curing chamber. The Chandler Engineering Pressurized Curing Chambers have been used in hundreds of laboratories and have application in research centers, product development laboratories and field laboratories. The curing chambers are simple to operate. All of the operational controls are conveniently located on the front panel. The temperature and pressure are easily read on the panel gauges and digital indicators. A programmable temperature controller is capable of controlling multi-slope temperature gradients during a test. In addition, the temperature controller will control the cooling rate at the end of the test in conjunction with the application of cooling water. Pressure is generated with an air-operated high-pressure pump, and control is maintained with a pressure relief valve.